Cutleaf toothwort, Cardamine concatenata, in habitat. Cutleaf toothwort or pepper root is one of more than 150 species in the genus Cardamine, a group of annuals and perennials in the mustard family (Brassicaceae) that occur worldwide. Native to much of the eastern half of North America as far west as the Dakotas down to Texas in zones 3-8, Cardamine concatenata is one of the earlier spring wildflowers of moist forests and woods. This small spring ephemeral was formerly known as Dentaria laciniata, so sometimes is listed as that or C. laciniata or D. concatenata. There are several other species of Cardamine that are native to Wisconsin, as well as two weedy types (C. flexuosa and C. hirsuta) that were introduced from Europe. The common name of toothwort refers to the tooth-like projections on the underground stems (actually leaf scars from the previous seasons growth). The leaves and rhizomes are edible (with a spicy flavor inspiring the common name of pepper root) and the plants were used medicinally by indigenous peoples. The leaves have three deeply cut lobes that make it appear 5 parted. The perennial plants grow 3-12 inches tall from fleshy, oblong, knobby, jointed rhizomes that resemble a string of beads. The root system also produces small fleshy tubers. The spreading rhizomes are fairly shallow, growing parallel to the surface of the ground to form vegetative colonies. The plants have rosettes of basal leaves and unbranched flowering stems with leaves in whorls of three above the middle of the stem. Each greyish green to medium green, hairless leaf is up to 3” long and across. 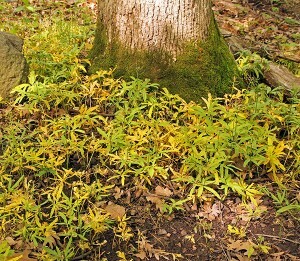 The foliage turns yellow in late spring. Both basal and stem leaves are deeply cut into three lobes and also toothed along the margins so they appears to be 5-parted. The foliage turns yellow and disappears by early summer. Toothwort blooms a few weeks before deciduous trees leaf out. This early-season bloomer – flowering for about two weeks before deciduous trees have leafed out – bears many flowers in a short, loose terminal raceme on each flowering stem. The rather floppy inflorescence elongates as it ages. The fragrant, white to pink flowers are ½ to ¾ inch long with long stalks. Each flower has four petals characteristic of the mustard family (arranged in the shape of a cross), as well as four green or purple sepals, a single pistil, and six stamens with conspicuous yellow anthers. The flowers appear bell-shaped because they never completely open. The flowers are visited by several types of bees and less commonly by early-flying butterflies or bee flies. Cutleaf toothwort blooms in loose terminal racemes (L), with white flowers on long stalks (C) and four petals (R). Flowers are followed by elongated fruits up to an inch long with a slender beak at one end. The erect, pod-like siliques each contain a single row of 10-14 small, brown, flattened ovoid seeds. The seedpods are initially green, turning to brown in late spring, and split open with a twist to eject seeds when ripe, several weeks after forming. Flowers are followed by elongated fruits (L-RC) with a slender beak (R). 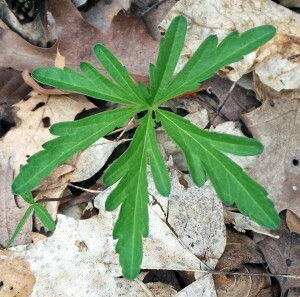 Cutleaf toothworth grows best in rich soils under deciduous trees. 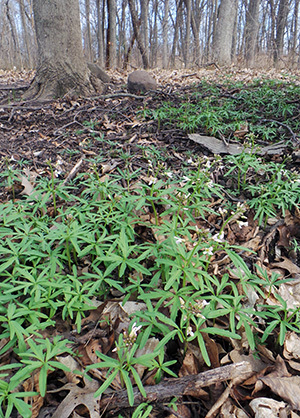 This native woodland perennial grows best in rich, moist soils with decaying leaves in areas with dappled sunlight that will be shaded in the summer. 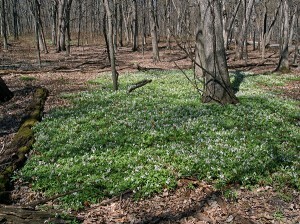 It is commonly found in association with other spring ephemerals such as bloodroot (Sanguinaria canadensis), trout lilies (Erythronium sp. 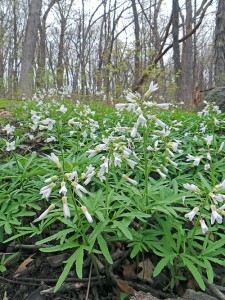 ), Dutchman’s breeches (Dicentra cucullaria), spring beauty (Claytonia caroliniana), and trilliums. 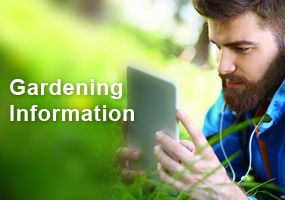 The interesting foliage and attractive flowers provide early spring interest in woodland gardens, mixed borders, and the front of perennial beds. In natural areas it is frequently displaced where garlic mustard (Alliaria petiolata) has invaded. This plant has no significant insect or disease problems. Cutleaf toothwort can be propagated from seed or division of the rhizomes when dormant. 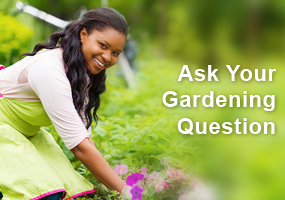 Seeds should be sown fresh as they lose viability quickly in storage. They require warm conditions followed by cold stratification and it will take 3-4 years for the seedlings to flower. 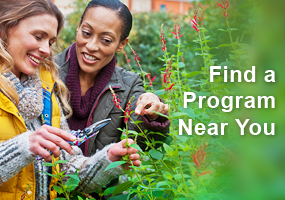 Dig the fragile rhizomes carefully as they easily break into segments. Love the fact that this is an early blooming flower that attracts the early bees and butterflies. This, as well as liking dappled sun and soil with decaying leaves will be perfect for woodland areas in the yard. Also interesting some of this is edible–multiple benefits ! Love the fact that this is an early blooming flower that attracts the early bees and butterflies. This, as well as liking dappled sun and soil with decaying leaves will be perfect for woodland areas in the yard. Also interesting that parts of this is edible–multiple benefits !